Editor’s note: After having his wallet seemingly stolen, the author now tries to get some answers with the help of police and security staff. Those answers prove surprising. Once I had changed into the sauna uniform, ochre t-shirt and long shorts, the owner led me into the sweltering main room where we wound through snoring, scratching and shifting bodies to a raised wooden platform under which the owner deftly ducked and pointed to a single spot next to a man sleeping flat on his back. I told him it was too hot to sleep but he motioned under with both hands and said, “rest, rest.” Resistance seemed futile–and I had nowhere else to go–so I lowered myself into the corner space and cursed my night of decision-making. At 2 a.m. on a cold night in late December, I finally decided to enter the Suseo Hyundai Ventureville building, which is attached to Suseo Subway Station and has, among other things, banks, a 24-hour convenience store and sauna, restaurants and shops. I had put myself in this situation by leaving a social engagement in central Seoul a bit late and riding the subway until it stopped, at which point I felt confident that I’d just hail a taxi for the 30-mile ride to my apartment in the bucolic outskirts. Alas, my plans fell apart. Philippines: Too Dangerous for Koreans? The news of the death of a Korean student in the Philippines hit the headlines this week and sparks worry about the safety of Koreans living in the country. The 21-year old student, who had been living in Manila with her brother for several years, was abducted last month. She was last seen riding a taxi in Pasay City on March 3. It took 36 weeks, but I finally had a script refused for broadcast. 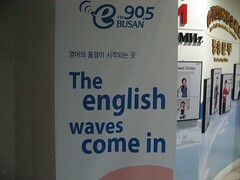 When I started doing my weekly segment with Busan e-FM, it was with the agreement that I could be honest about my experiences in Korea, but the question is, does Korea want to be honest about itself? With the success of the women-only parking spots, the men in the National Assembly have decided again that they know what women really need: their own subway lines. A week earlier while I was waiting to go on air at the station, a situation was posed which led me to say “But that would be unethical”. I needed to repeat that last word a number of times. We quickly established that the English word ‘ethical’ may sound hilarious to Koreans. I wasn’t entirely convinced that this was merely a phonetic issue, which resolved me to pick a topic related to ethics for this week’s show. Another post in our series on Korean Urban Legends and Spooky Stories. I am not usually scared of insects, every now and then I actually even enjoy eating Beondegi (번데기), the infamous Korean dish made out of silk worms. But I must say cockroaches are one of the things that scare me the most. I almost puked while translating these stories but I could not let you down. Behold today's urban legends: the Cockroach Infested Tampon, the Cockroach Facial and the MP3 Kidnappings! As my wife and I entered the subway carriage I was so wrapped up in role-playing my impending potential immigration interview that I paid no attention whatsoever to my fellow passengers. The upshot of this was that when she asked me about the man and woman sat opposite us I actually had to look to understand what was going on.